This is the beautiful journal Brain got me for my birthday (from Florentine in Syndey). And the uber-cute bookmark. And today the bird’ish-raven necklace arrived today (appropriate for our Midnight and Moonshine collection). 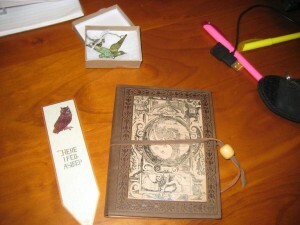 I’m not quite sure how I can bring myself to write in something so lovely! This entry was posted in Random and tagged florentin, Midnight and Moonshine. Bookmark the permalink.